Both Britain and Ireland are famous for their love of biscuits (cookies) and that list includes the Hobnob which also was voted in the top ten of Britain's favorites. They are made commercially, but making your own is so much fun! 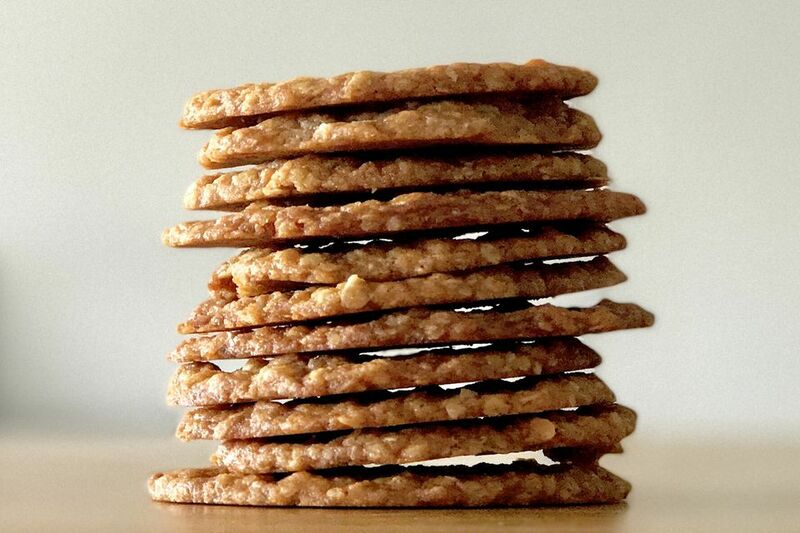 This Hobnob recipe shows just how easy these golden colored, oaty, buttery cookies are to make. Once you have make a batch, they will be on your baking list forever. This recipe delivers about 20 cookies/biscuits which should see you through at least a day. In a large baking bowl, mix the sugar and the butter together until light and creamy—you can use a fork or an electric hand mixer for this . Add the milk, Golden Syrup, and beat again. Sieve the flour with the baking soda into the bowl and then fold carefully into the the creamed mixture using a metal spoon. Finally, add the porridge oats and fold into the mixture. Pop the bowl into the fridge for 10 minutes. Meanwhile, lightly grease a baking sheet or line with parchment paper. Divide the dough into 1 oz (25 g) spoonfuls. Quickly roll the measured dough into balls and place them onto the baking sheet. Space the balls about 2 inches (5 cm) apart as they will spread in the cooking. Once the tray is full, place onto the middle of the heated oven and cook until golden brown, around 25 minutes. This process cannot be rushed by increasing the temperature as all that will happen is the biscuits will burn. Remove the tray from the oven and leave to stand for about 10 minutes so the cookies can begin to set. Using a spatula, transfer the cookies to a cooling rack and leave until they are completely cool. Of course, the temptation to eat the Hobnobs immediately will be strong. If you can resist eating them all, however, store them in an airtight tin or plastic lidded box. Eat within a week. Add a small handful of dried fruit such as raisins, currants, or sultanas. Add them with the oats and stir in carefully. Add a teaspoon of ground ginger with the flour. This will still give the Hobnobs a sweet taste but with a hint of spicy ginger. Melt 100 g of milk or plain chocolate in a bowl over simmering water. Once melted, stir with a wooden spoon. Once the plain hobnobs are cold, gently dip the top of the biscuit onto the melted chocolate and return the biscuit to the cooling rack and let the chocolate set. Now all that's missing is a nice cup of tea!